Custom Tote Bags Feature Your One- to Full Color Design on the Front of Each Tote! Lightweight and highly durable, these Custom Tote Bags make perfect shopping bags. The Custom Tote Bags range in size from 12" wide by 10" high to 14-7/8" wide x 15-3/4" high. All our Tote Bags feature comfy, soft loop handles that match the overall Bag color. Choose from four Custom Tote Bags: standard Custom Tote Bags; Fiesta Custom Tote Bags with hemmed openings and black accent piping; Snap and Go Custom Tote Bags with front pouches and a handy tri-fold design; and Custom Tundra Tote Bags with 8" wide gussets and reinforced bottoms for extra heavy shopping loads. Choose from either a one-color imprint or a full color digital imprint for your design. The minimum order for all our Custom Imprinted Tote Bags is 100 pieces. Production time is about seven to ten business days after proof approval. 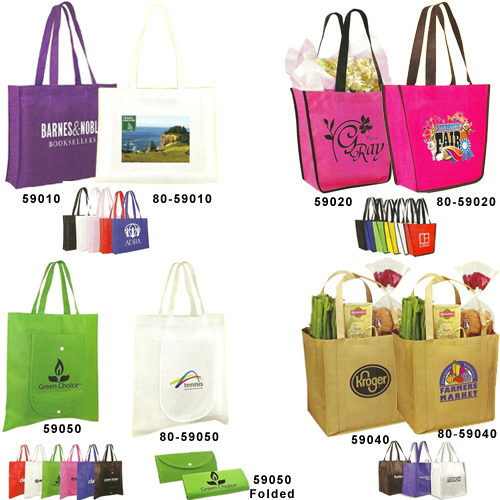 59010 Non-Woven Tote Bag 1.75 1.57 1.53 1.48 11" 8-1/2"
59020 Fiesta Tote Bag 2.15 1.62 1.53 1.44 6" 5"
80-59020 Fiesta Digitally Printed 3.19 2.83 2.74 2.65 4-1/2" 5"
It's easy to get started with your Custom Printed Tote Bags. Simply email your camera ready AI or EPS vector art file to graphics@kardwell.com and then contact us at 1-800-233-0828.